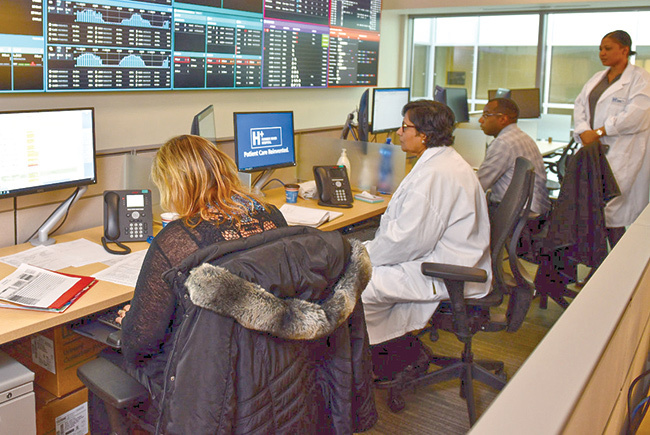 Tampa General Hospital's command center could look similar to this one at Humber River Hospital in Toronto. At Tampa General Hospital, we don't just practice medicine. We define it. Tampa General Hospital and its partners are creating an innovative, patient-and-provider-centered system of care that will change the healthcare landscape on the west coast of Florida. The blueprint is in our new five-year strategic plan, which was created in a completely transparent way. SAFETY AND QUALITY We are committed to becoming the safest hospital in Florida and one of the safest in the nation. Our top priority is to ensure “zero harm” to everyone — our patients, team members and physicians. In just one year, our overall patients’ rating of our care has increased 12 percentile points, while the percentage of patients who are “likely to recommend” our hospital to others has risen five percentile points within the national database. Those increased scores put us in the top quartile of U.S. hospitals — but we aim to keep improving. OPERATIONAL EXCELLENCE We have partnered with GE Healthcare to create a new Care Coordination Center. The new data analysis center will improve the hospital’s efficiency and shorten stays for our patients. We estimate it will save TGH about $62 million over five years. We will reinvest that money into our people and infrastructure because we believe the future health system will be less about brick and mortar and more about experience, value and technology. GEOGRAPHIC EXPANSION Tampa General is growing outside the Tampa Bay market to make our expertise available to a greater number of Floridians. Our new ventures will be strategic, thoughtful and innovative. ECONOMIC IMPACT We employ more than 8,000 team members, have 1,400 physicians on staff and generate more than $1 billion in revenue. A recent economic impact study concluded that, in Hillsborough County alone, Tampa General contributed more than 21,000 jobs and almost $2 billion in gross domestic product, which represents more than 2% of the county’s total economy. RELATIONSHIPS Our relationships with USF Health and our private practice physicians have never been stronger. We’re fortunate to have such great partners as USF President Judy Genshaft; Dr. Charles Lockwood, senior vice president of USF Health; and Dr. Ravi Bukkapatnam, a private practice physician who has just finished a two-year term as TGH’s elected chief of staff, to help us build on these relationships. We’re going to create a contemporary system that is focused on world-class outcomes and clinical service because our patients deserve nothing less.